Those Who Knew Jesus Referred to Him as the Logos and Theos. Fiercely monotheistic, the Jew's knowledge of God was deeply ingrained - handed down from generation to generation. 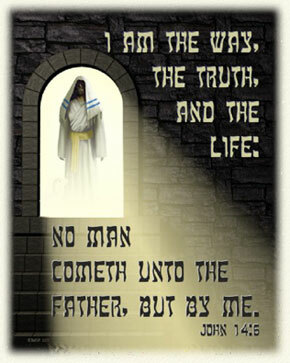 No Jew would ever have believed in any other God other than the Father of Abraham, Isaac, and Joseph - the Great I AM. No Jew would have called any other creature theos (God). Yet, in the opening verse of his Gospel, John clearly states that in the beginning Jesus Christ as the Word (logos) was with God (theos), and was God (theos). And he was not the only one. Jesus not only made some outrageous claims that few ordinary people would make, but gave Himself four titles - the significance of which were not lost on His opponents who realized they were declarations of equality with God. Also, in spite of the fact that the Scriptures teach that YHWH alone is to be worshipped, Jesus never rebuked anyone for worshipping Him. Considering the claims Jesus made, the titles he gave Himself, the worship He accepted (and even encouraged) the only possible conclusion one can come to is that He suffered from grandiose delusions or He was the Son of God as He said. Jesus' fulfillment of numerous Old Testament prophecies about the coming Messiah. In the Old Testament, many statements and prophecies were made by Yahweh about Himself. A study of the New Testament reveals that these were exactly fulfilled by Jesus. Additionally, God the Father and Jesus shared common attributes and titles - including the First and The Last, the Alpha and The Omega, and the Beginning and The End. In fact, the parallels are so close that there can be no doubt that the same Person was being referred to in both sections of the Bible. Five passages in particular are often used as proof that Christ was not Deity. 1) Critics claim the He was denying His own goodness in Matthew 19:16-17. 3) Philippians 2:5-8 is often taken to mean Jesus emptied Himself of His divine attributes and thus was not God during His time on earth. 4) Luke 2:52 - Jesus increased in wisdom and stature is often believed to mean He learned as all humans do. 5) Colossians 1:15-18 states Jesus was the firstborn of all creation. Does this mean He was the first created being and not eternal? So how can all this be explained? How can Jesus and the Father be one, yet distinguishable from each other? In light of Jesus' statement that He "came forth" from the Father (John 16:27-30), second century apologist, Justin Martyr's analogy goes a long way towards understanding this difficult concept. Last, but far from least, one has to come to a decision about Jesus. Of course you can ignore the whole question and turn on the television instead, but, what you cannot do is come up with some patronizing nonsense about Him being a great human teacher/philosopher/good man. The door to that option has long been slammed shut. Much of the problem lies in the fact that many people are unwilling to accept things that not explainable by modern science. Even those that believe that God exists, seem not to realize how far His abilities lie beyond our present knowledge and understanding, however advanced we may think that is. While there is no question that faith does play a major role, God has never asked us to accept anything on 'blind faith', but has provided evidence by the truckload. It is we who refuse to fairly examine this evidence, but come to it with pre-conceived ideas and/or (all too often) misinformation from others who either had an axe to grind, or were themselves deluded. And why is this important? Simply because far from being outdated, out of touch, and largely irrelevant to modern society, the Kingdom of God Jesus was sent to earth to proclaim (No, His main message wasn't about love) is exactly the utopian world most men and women can only dream of. However, there is also a warning. Artwork provided courtesy of James "theo" Theopistos.